St. Hilda was the daughter of Prince Hereric of Deira, a nephew of King Edwin, and his wife, Lady Bregswith. Hereric had followed his uncle into exile during the invasions of King Aethelfrith of Bernicia and Hilda was probably born at the court of King Raedwald of East Anglia at Rendlesham in Suffolk. Two years later, in the year that Edwin recovered Northumbria, Hereric was at the court of King Ceretic of Elmet. Here, he was poisoned and subsequently died and this may have prompted King Edwin's invasion of Elmet in AD 617. Hilda and her sister, Hereswith, were raised at Edwin's dual-court at York and Yeavering and were both baptised by St. Paulinus in AD 627. They went on to be educated by him, though Hilda did not enter the service of the Lord until the age of thirty-three. He was the Archbishop of York of the time and a Roman monk in St. Andrew's monastery at Rome. He was sent by St. Gregory the Great in 601, with St. Mellitus and others, to help St. Augustine. Hereswith married Prince Aethelric of East Anglia, brother of King Anna, to whom she bore the future King Ealdwulf. Hilda appears to have accompanied her sister to East Anglia. However, by AD 647, Hereswith had entered the monastery of Chelles in France. Hilda planned to join her, but was persuaded instead, by Bishop Aidan of Lindisfarne, to return to Northumbria. He gave her a small plot of land on the north bank of the Wear to build a monastery, but she soon moved on to Hartlepool where she succeeded St. Heiu as Abbess. She organised the community according to the Rule of the Irish Church, particularly that of Columbanus. 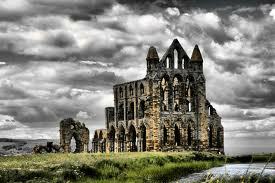 In AD 657, Abbess Hilda founded a monastery of both monks and nuns at Whitby where she finally settled. Hilda was a patroness of the arts, including her former cowherd, the poet, St. Caedmon. She herself was a notable teacher. Bede tells us that all called Hilda 'mother' and it is evident that she had the confidence of bishops and kings alike and had developed Whitby into a famed centre of learning in Britain and the world. Her monastery trained at least five bishops. In AD 664, she played hostess to the famous Synod of Whitby at which the path of the Northumbrian Church was debated. It was decided that it should follow the teachings of the Roman Church rather than those of Celtic Irish Iona. Hilda herself was sympathetic to the latter party, but accepted the council's ruling. Fourteen years later, she was somewhat more enthusiastic in her support of Archbishop Theodore's division of Northumbria, as it meant that two of her pupils, Saints Bosa and John of Beverley, were raised to new Bishoprics. She died at Whitby, after a painful illness of six years, on 17th November AD 680. St. Hilda was buried at Whitby and miracles were soon reported at her tomb. She was venerated as a saint and her bones enshrined. Her shrine was demolished, in AD 800, when Whitby Abbey was invaded by the Danes, but her body was recovered from the ruins by King Edmund the Magnificent in the 10th century. He gave them to the Abbey of Glastonbury where the were revered until the Reformation. Her feast day is November 18th.